A few months back, I get at least one date referral a week from friends and office mates, and that is no exaggerated fact. I don't really express that I want a guy. In fact, I usually just smile and laugh off their offers when they go all-wing woman on me. Although as much as I enjoy being on my own, I also won't deny that there are definitely moments when I wish I had someone. ... moments when I would be a little jaded and silently snort at the sweet couple sitting in front of me on the bus. ...sigh-worthy moments when I would sit and dream about the time when that ONE guy will walk into my life. ... and the times when I would wonder whether there is truly someone out there for me because for all I know, God has meant me to be on the road to single blessedness, or what if I already missed out on the best person??! Gassp! These thoughts grounded on doubt, worry and fear remind me of a scene with a certain woman and a cunning serpent in a lovely garden thousands of years ago. Although she remembered clearly what God told them to do, she began to doubt and once there was doubt, it was easy for the serpent to sow more lies in her mind and soon it made her second guess God's character and His goodness. This doubt gave way to disobedience, followed by shame, guilt and fear. I fell in love twice and got my heart broken on both times. This is not counting the other times when I hoped and was disappointed with the other guys who came, went by and with whom it just didn't work out with (showbizzz answer!). So as much as I still believe in love, I am also quite scared in that department. When these Eve moments come, when our past haunts us, makes us doubt who we are and on the goodness and sovereignty of God, it's easy to just go for the second best or just stay within the bounds of the familiar. But God tells us to not worry, and reminds us that there is no fear in love because we are to hope in Someone who will never fail and disappoint us. ...when we look into our past, feel guilty and doubt whether we are still deserving of the best... when we look into the future and just become too scared to take on the challenge of being with someone that we just rather walk away so we will never get hurt. But what if we look to God and focus on Him? 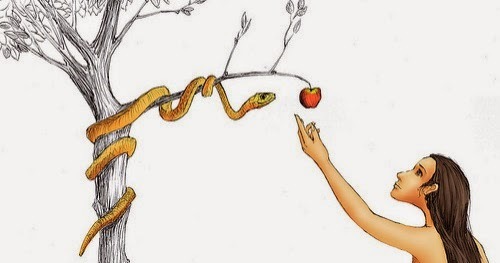 If Eve didn't for one second doubt that the commandment God has given them will lead them to the best promise ever, if she didn't become scared of missing out on what the serpent claim to offer her, if she didn't lose her focus on God's goodness and wisdom... then that fruit would have no appeal to her and she would wait for her prize patiently because she knows that nothing else would compare to what her God can offer her. ...Wise enough to know when a guy's heart is to glorify God alone, and brave enough to take on whatever challenges to fight alongside that guy when the time comes. ...Wise enough to give up my will for His glory -- to discern whether walking the path on my own is His will for me -- and brave enough to take on the journey because I know that He will be holding my hand all through out.